I see two crop-tops that show (or could easily show) belly buttons, a pair of shoulders, and three sets of knees. And no, it does not matter if the knees in question belong to girls or boys. This is not about body-shaming girls, the polemic in so many schools in the States. Rather, it's about what is considered respectful clothing for students, and it's a pretty conservative standard: You can sometimes get away with shoulders but never knees (!) or stomachs and belly buttons (!!) or hair dyed unnaturally (!!!). One of our friends, who attends a school that has no religious affiliation at all showed up to gym class this past June, during a heatwave, on a day that was about 104°F (40°C) in long, sporty shorts. She was given a large pair of enormous bright orange pants -- one of 50 or so the school has on hand -- that are, and I'm not making this up, called "shame pants" meant to humiliate the offending racy-clothes-wearing rebel. Ripped jeans in our house get covered with patches. The fact that I not only allow my daughters to dye their hair weird colors, on occasion, but that I'm actually the one who does the bleaching and dying makes me one of the "coolest" moms around, in the eyes of the French kids. The French just can't even imagine how hopelessly square I am considered in San Francisco. 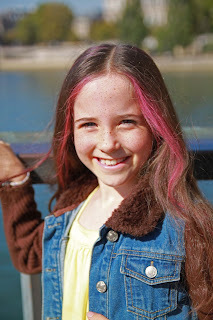 At first, we dye Gigi's tips red, wondering if she will get in trouble, but the school says nothing. So, we turn around and bleach a bigger swath the next time, dying it green. That's when we learn there is actually a school rule against dying hair "unnatural" colors. I guess the red is borderline "natural" so they let it go. I write a polite letter of apology to the school (we really didn't know) with a plea for leniency (and in fact she doesn't get any punishment) and a request that the rule be re-examined, for aren't the teenage years the perfect time to try out some harmless self-expression (this is met with crickets chirping). Recently, a friend and her 16-year old daughter are visiting from San Francisco. Gigi and I ask them if she would be allowed to wear her ripped jeans to school, and they just laugh at us: "It's San Francisco! People show up to school in tiny mini-skirts, with half their head shaved and the other half bright blue, with pierced eyebrows and a chain connecting it to their ear-cuff. And even that's no problem." Ah, it's like after five years here, we've forgotten all about personal liberty. What a lovely concept. I think my girls will have to try some on sometime. Chavroux is an industrial pasteurized goat cheese, young and fresh, so that it's a fluffy, moussy, almost cream-cheesy spread, with a slightly yogurty goat tang. The cheese was created in 1985 and is manufactured in Charentes (great goat country). As industrial products go, we rather like it. It's fine in the children's bags for snacks after school on their way to activities, and easily transportable in one of its little plastic tubs. Our girls like to dip crunchy pretzels in it. Why not? It's more substantial as after-school-snacks go than the typical pain au chocolat. Though, in all fairness and to not sound too self-righteous, I must admit that a more ideal after school for my girls snack has Chavroux, pretzels, some fruit, and a pain au chocolat. It does also come in bigger tubs, but unless I were using it as an ingredient (perhaps a replacement for Philadelphia cream cheese, if I wanted a goaty cheese cake? ), I can't imagine buying a big tub; it's real raison d'être in my mind is that it's easily portable as a snack. Chavroux is an industrially made, completely uniform cheese, so right there it seems like an appropriate cheese to use to talk about draconian, early 19th-century dress codes enforced throughout French schools (though, I must say, the French are not actually big into school uniforms, even at private Catholic schools). Add to that the fact that the cheese is completely covered up, and you'll understand why I choose it. I can't say it's my favorite cheese, any more than I can say that this cramping of children's style is my favorite part of France. Wauw no pork modest clothing what is next religious studies in france schools?